Crikvenica is one of top destinations for people from Zagreb, especially young tourists looking for fun. It consists of four villages and the most famous of them is Selce. 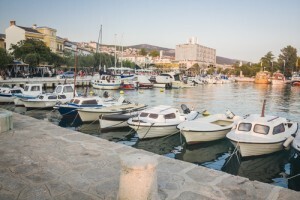 Crikvenica is popular among domestic tourists primarily because it is the nearest seaside town to those coming from central Croatia, and this is why many choose Crikvenica as their summer destination. Crikvenica is a small town with just over 10 thousand residents. In addition to numerous Roman Catholic churches, tourists can also visit the Russian Orthodox Church. Crikvenica is not your standard “stone, karst and olives” town – it is brimmed with a variety of natural resources. A trip to Novi Vinodolski is highly recommended, and welcoming hosts are always ready to guarantee a good time and pleasant memories of your stay, which is why many tourists return to Crikvenica. In the town’s centre you can find the Aquarium: on 200 square feet visitors can view more than 100 types of Adriatic fish, 50 types of tropical fish and certain types of freshwater fish. And what kind of an aquarium would this be if it did not include piranhas and sharks? This town offers a perfect combination of sunrays, fresh air, seaside fragrance, coastal rock and greenery of parks and promenades. Crikvenica is full of long gravel beaches and sand coves: Balustrada and the Town Beach in the centre along with beaches Omorik in Dramalj and Rokan in Selce are Blue Flag beaches, which means they meet high environmental quality standards regarding clarity of water and cleanliness. The town’s main beach has ramps for the handicapped, and there is also a beach for pets. People of Crikvenica care about cleanliness and every guest should respect their efforts, whether they come here to relax, sail the Adriatic, do sports, fishing or diving. This town simply has its rules which everyone should follow because this is a town with long history and tradition – it deserves respect, and if you show it, then Crikvenica will not disappoint you and will offer plenty to its visitors. Crikvenica has a wide range of private accommodation units for its guests at favourable prices: hotels,camping, rooms, villas, apartments and car camping are only a part of the offer. BTW, if you are visiting with your better half, be sure to take the Road of Love or get lost in the Labyrinth of Love.